As more addiction studies are unveiled, it is becoming apparent that nutrition and diet can largely impact an addict’s success in recovery. Maura Henninger, a naturopathic New York City physician states, “People who have been abusing (alcohol or drugs) tend to lose sight of self-care.” They must learn how to take care of themselves all over again. Nutrition treatment programs for addiction are just beginning to make an impact on the rehabilitation industry. Some drug treatment programs are short in duration, meaning there is not much time for alternative treatment options. In the first 30 days of rehab most addicts are focused on achieving and maintaining sobriety, not altering their diets. However, as more dietitians, physicians, and therapists explore the many benefits of nutrition in addiction recovery they are becoming more prevalent in the rehab community. David Wiss, the founder of Los Angeles-based Nutrition in Recovery and registered dietitian nutritionist stated, “This idea that nutrition is critical for addiction recovery has not quite caught on to the majority of treatment providers and to people themselves,” when referring to early recovery. Restore Health and Wellness Center has taken notice to the advantages nutrition therapy programs offer. Our qualified dieticians and nutrition experts have made dramatic differences in the lives of those who have engaged in this form of care. A naturopathic doctor in Arizona, Ravi Chandiramani, said “I think that in general, people fail to make this correlation between their diet and their physical, mental, and emotional health.” It has become the responsibility of both holistically and traditionally oriented addiction care providers, such as Restore, to educate the public on the role of nutrition on overall health and wellness. Addiction deteriorates both an addict’s mental and physical health. By the time people seek the help they need they are most likely malnourished. Prolonged drug and alcohol abuse wreaks havoc on the body. It affects an addict’s appetite and how the body absorbs nutrients, as well as causes substance abusers simply not to care about their general health. 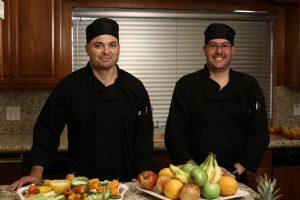 Restore Health and Wellness’s, culinary trained, on-site chefs. Examples of the malnourishment caused by substance abuse depends on the substance in question. Those who are addicted to opiates, for instance, are usually deficient in calcium, B6, iron, and vitamin D. Whereas cocaine abusers typically have low levels of omega-3 fatty acids. Alcohol, on the other hand, generally has the most serious impact on the body because it causes it to excrete greater amounts of nutrients, according to Henninger. Symptoms of malnutrition may vary, but Henninger has also stated that magnesium loss usually portrays itself as feebleness, anxiety, and insomnia. Calcium loss leads to an early onset of osteoporosis and Vitamin K and C deficiencies may result in slow healing wounds and overall immune system weakness. In addition to vitamin deficiencies, addiction destroys an addict’s self-esteem and the body’s natural production of feel-good chemicals. Bloodshot eyes, scarred skin, rotting teeth, yellowing complexion, are just some ways in which prolonged substance abuse can alter ones physical appearance. Altering a diet will not make immediate changes to an addict’s mental health or physical appearance, but it will significantly aid the body in the healing process. It may not be possible to reverse all the damages caused by prolonged substance abuse. However, proper nutrition can go a long way towards transforming your mental and physical health. The dedicated staff at Restore Health and Wellness Center understand the importance of nutrition in addiction recovery. We offer customized nutritional therapy programs along with our traditional therapies. Less sugar- Sweetened foods can cause blood sugar levels to be unstable. Refraining from eating foods full of sugar will stabilize these levels and consequently help with anxiety, depression, and mood swings. More Protein- Prolonged substance abuse can cause an addict’s neurotransmitters to be severely damaged or depleted. Fortunately, the amino acids found in proteins can serve as a building block for these neurotransmitters. Fewer Refined Carbs- Whole grains (such as whole wheat bread over white bread) are packed with nutrients such as protein, fiber, B vitamins, trace minerals, and antioxidants. They help replenish vital nutrients to an addict’s overall health. More Healthy Fats- All fats should not be avoided- it is a common misconception that fats are bad for your health. Good fats actually work with the body to absorb fat-soluble vitamins. Fewer Processed Foods- In early sobriety, liver repair is critical. Processed foods with artificial ingredients hinder this process of repair. More Fiber- Fruits and vegetables are key to healing the gastrointestinal system. Less Caffeine- Caffeine can easily throw off the body’s natural balance, oftentimes causing anxiety and insomnia. It is vital that addict’s remain well-rested and clear minded, especially in the early stages of recovery. A true addiction recovery is not simply about finding sobriety, it is also about restoring your mind and body. Healthy nutritional practices are one of the best ways addicts can replenish what was taken by prolonged substance abuse and addiction. For a customized nutritional rehabilitation program, contact Restore Health and Wellness Center. Our nutrition specialists, doctors, therapists, and other clinical staff will work together to make sure you get the nutritional and traditional counseling you need to begin the road to recovery on the right foot. Diet plays a vital role in general well-being. With a healthy diet and our individualized therapeutic approach, we alter the way our clients feel by helping them change the way they treat themselves and their bodies. Pick up the phone today and call 855-636-5790, allow us to build the foundation for your lasting recovery.